Cakes mean celebrations and i never let any occasion pass by without celebrating it. 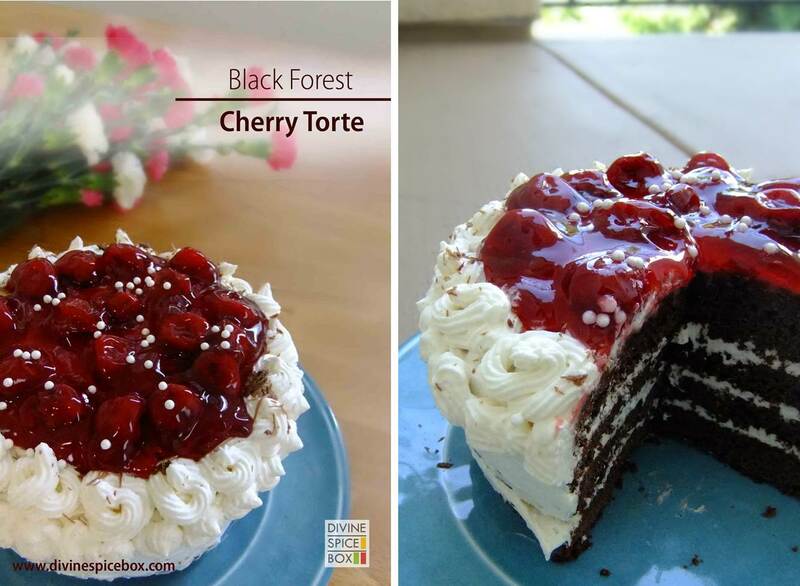 This time it was for my husband’s birthday and i wanted to make his favorite, Black Forest cake. 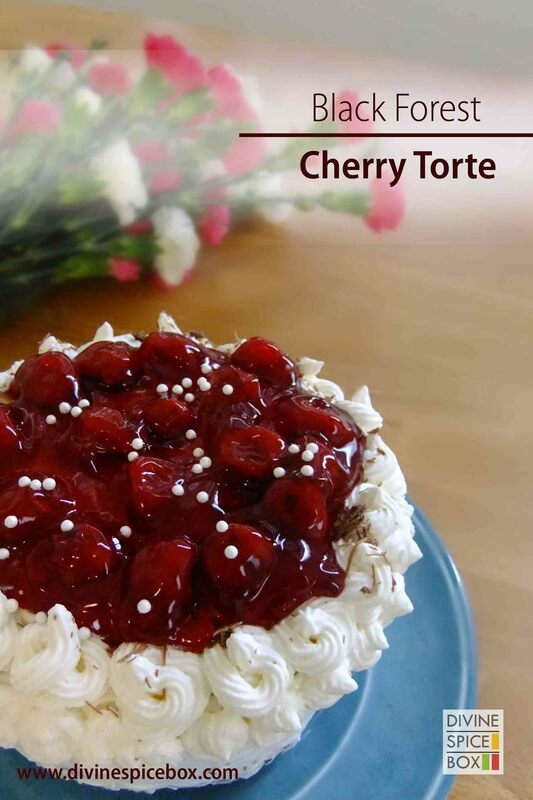 Creamy, moist and cherry-licious , this cake was too tempting not to try. I went for it and it turned out more than awesome !! So, here i am, presenting proudly, my first frosting cake – Black Forest Cherry Torte ! I have loved frosted cakes for as long as i can remember but i have a simple rule : the cake has to rule the frosting, not the other way round. For me, i am looking for cakes which have the flavour coming from the cakes and the frosting just does its work of being a true companion to the cake but not over power it. Most of the cakes i eat in the finest of the bakeries have way too much frosting in them making the cakes extra sugary a.k.a calorie heavy. I think that was the reason why i was always a bit reluctant about making cakes with frosting on them. This time though, it was a cake for my husband’s birthday and he absolutely adores the black forest cake. So, it had to be this very cake. It was time to shed my fears of working through the frosting and i decided to make this one. Is’nt it gorgeous ? It was so pretty that it almost felt cruel cutting into it. So delicious ! We will begin with baking the cake. Preheat the oven at 375 F and keep it ready. Now, in a pan add the butter and heat it up on medium heat on stove. Once the butter melts, add in the milk, coffee, chopped chocolate, vanilla essence and sugar. Combine well till the mixture is homogenous. Remove from stove and let it cool down. Once the mixture is cooled down, slowly add in the egg and whisk well till well combined. If not using the egg, leave this step out. In a separate bowl, sieve in the flour, baking powder, soda bi carb, salt, cocoa powder and mix well. Now, slowly incorporate the dry ingredients in the wet ingredients and gently fold in till the mixture is homogenous. Pour the batter in the pre-greased cake tin and bake it in the oven for about 45 minutes or till the pin inserted in it comes out clean. Remove from the oven and let it cool down completely. Now, cut the cake into 4 equal layers and keep aside. You really want the cake to cool down completely before cutting it into layers so that the cake stay put together and not crumble. Now, lets proceed with the whipping cream. In a mixer, add in the cold heavy cream, vanilla essence and super fine sugar and beat on high speed till it forms soft but stiff peaks. The Whipped cream is ready. Now, we will just assemble them. Place the base layer of the cake and on it put a generous quantity of whipped cream. With the help of a knife or a spatula, spread it evenly on the base and then put another layer of cake on top. Repeat with whipped cream and continue to stack all the 4 layers together. Stick the cake in the freezer for about 15 minutes. This will help in cooling the whipped cream in between the layers a bit so that it is easy to cover the outer surface of cake with whipped cream without the layers shifting from its position. Remove from freezer and place the cake on the serving flat tray. Now, gently apply the whipped cream on the outer surface of the cake and cover any un-eveness. Once done, arrange the cherry filling in the centre of the cake and then with the help of a piping bag, pipe some flowers around it on the edge of the cake. Black forest cherry Torte is ready ! Finish with a sprinkle of chocolate shavings and serve cold. The cake was not only moist but even with so much whipped cream, it is so light and sinfully delicious ! I was wondering that with all that cherry filing going on top, it would make the cake extra sweet, but the slight tanginess of the cherries worked out perfectly. The flavours of the cherries was absolutely harmonious to that of the cake and the frosting. I also made sure to not go over board with the frosting and it was just the perfect amount in each slice! This was a beautiful first experience of working with frosting and i am now really looking forward to honing my skills in that 🙂 Do make this cake and give yourself a happy treat ! Beautiful, Prachi! Truly a labor of love. What a lovely cake Prachi. Belated Birthday wishes to your husband. Sugar syrup, coke or any ariated drink? Hi Preeti. If u want to make more juicy layers, u can either make a sweet black coffee to apply so that the taste remains similar or a very thin Sugar syrup. I would not recommend an aerated drink as it might not go with the taste of this cake. U can also use some sort of cherry crush if u want the slight cherry taste in between. Hope that helps! This looks stunning! What a lovely gateau, Prachi! Thanks!! But so does yours! What a beautiful cake! This cake would be very impressive to serve to guests. Alright, I still haven’t gotten over that Mango cake you brought to FF awhile back and now this!? Looks so good…mmm.